Saint-Nazaire, France, 14 June 2018 – MSC Cruises and STX France signed today an order for the construction of a fifth Meraviglia class cruise ship. Due to be delivered in 2023, this vessel will be equipped with a new generation of dual-fuel engines designed to run on liquefied natural gas (LNG). She will also feature other innovative environmental technologies, notably including an advanced wastewater treatment system compliant with the world’s most stringent regulatory standards, including the provisions enshrined in Resolution MEPC.227 for the Baltic Sea. This announcement was made at a unique ceremony held at the Saint-Nazaire shipyard in the presence of Bruno Le Maire, the French Minister of the Economy and Finance. 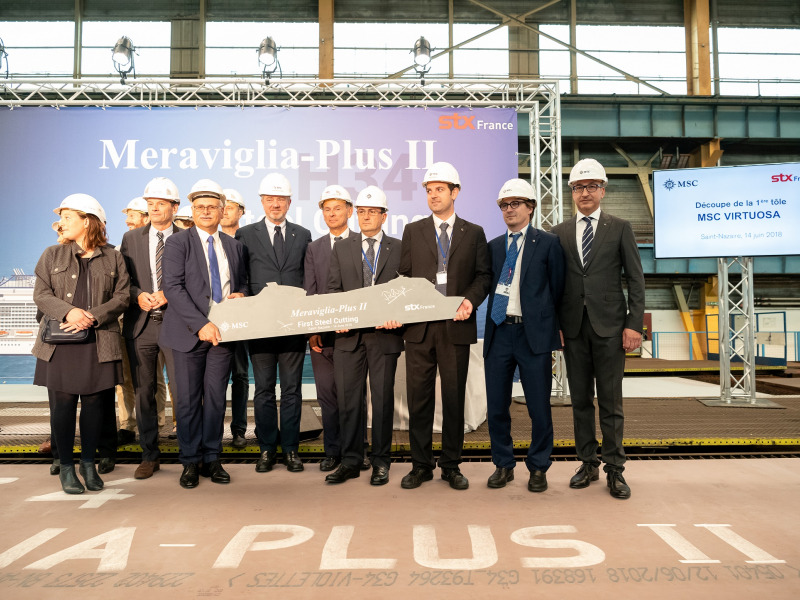 STX France and MSC Cruises celebrated three major ship building milestones: the Steel Cutting Ceremony of the 4th Meraviglia class vessel where MSC Cruises announced that the ship will be named MSC Virtuosa; the Coin Ceremony of MSC Grandiosa; and the Float-out of MSC Bellissima. For the first time in Saint-Nazaire’s history, three cruise ships belonging to a single cruise brand are under simultaneous construction at the shipyard. Speaking before opening the valves to flood the dry dock where MSC Bellissima has been assembled, Pierfrancesco Vago, MSC Cruises’ Executive Chairman, said: “With the announcement of yet another new vessel, the 13th under our 10-year investment plan, we are affirming our commitment to sustainable growth for our Company. I say this while three more next-generation MSC Cruises are now simultaneously under construction." The agreement for the additional Meraviglia-Plus ship represents an additional investment of €900 million. MSC Bellissima will be christened at a glamorous ceremony in Southampton on 2nd March 2019 whilst MSC Grandiosa will be christened in Hamburg in November 2019. MSC Bellissima will also be the first ship to feature the industry’s first digital cruise personal assistant, Zoe, as a new feature of MSC for Me, the Company’s digital innovation programme. A bespoke device is being designed specifically for use in the cabins on board and will be available in seven languages: English, French, Italian, Spanish, German, Brazilian Portuguese and Mandarin. This digital service will provide guests with a simple and stress-free way to find out information that traditionally is asked in person at the Guest Relations desk. This way the guest can find the information without having to leave their cabin. This will then also be available on MSC Grandiosa. Both ships will offer two brand new shows from Cirque du Soleil at Sea, created exclusively for MSC Cruises guests. This is part of a long-term partnership between MSC Cruises and Cirque du Soleil, the world leader in artistic entertainment that will result in a total of eight original shows that will be available on MSC Cruises’ four Meraviglia and Meraviglia-Plus generation ships – two different shows on each ship. MSC Grandiosa will showcase an even larger Mediterranean-style promenade, the ground-breaking feature unique to the Meraviglia and Meraviglia-Plus prototypes, that serves as the social hub of the ship with an array of shops and specialty restaurants as well as a new bar and lounge, L’Atelier Bistrot that will offer lounge seating with a stage and a dance floor, impressionist art will be on display in this space will also have "terrace" seating with Parisian Bistrot tables and chairs on the Promenade. Throughout the day and the evening, this award-winning promenade hosts surprise performances, including flash mobs and themed parties as well as the awe-inspiring projections on the even longer 98.5-metre LED Sky screen. MSC Cruise’ award-winning family offering will also see some new features and on MSC Bellissima this will see the introduction of a fun Grand Canyon theme for the Aquapark and a host of new magic inspired kids entertainment for kids of all ages. The family deck will include the DOREMI Studio Lounge, a dedicated lounge for all family activities, DOREMI Tech Lab, a must visit destination for kids who love technology, as well as facilities designed in partnership with family experts including the LEGO Group and Chicco. 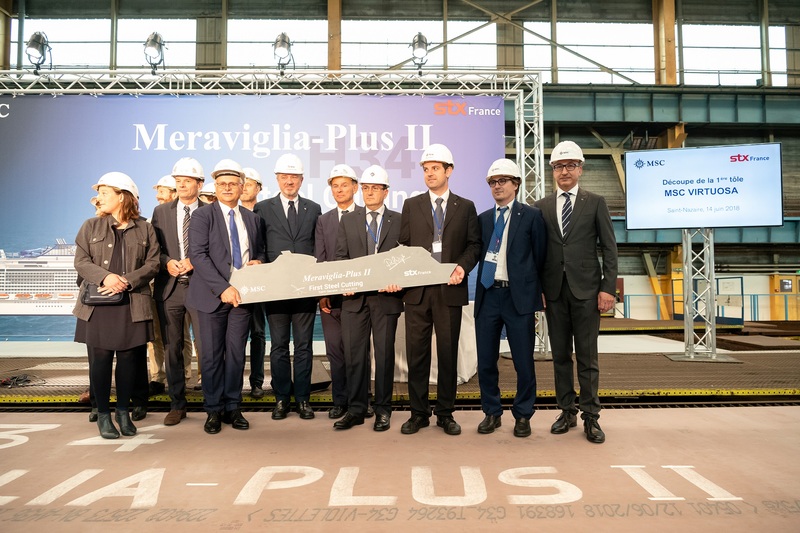 About MSC Cruises’ fifth Meraviglia class ship: The new ordered ship will have the same dimensions as the two MSC Cruises’ Meraviglia-Plus vessels, with a slightly higher deadweight and displacement due to the heavier LNG-powered dual-fuel engines.